A rich and delicious cream cheese pastry makes this apple pie inviting and extra special. Sprinkle some decorative sugar over the glaze just before baking. I used a combination of Granny Smith and Golden Delicious apples in this pie, to balance the sweet taste with tartness. For the pastry, using an electric mixer, beat the 12 tablespoons of butter and the cream cheese until creamy. Add the cream and beat until smooth. Add the flour, sugar, and salt. Beat on low speed just until the dough holds together. Turn out onto a generously floured surface. Gather into a ball, knead a few times, and divide into two equal pieces. Shape into disks and wrap in plastic wrap. Refrigerate for 30 minutes. Meanwhile, prepare the apples. Peel, core, and slice the apples into thin wedges. Combine the slices in a large bowl with the lemon juice, 1/4 cup of flour, cornstarch, 1/2 cup granulated sugar, brown sugar, cinnamon, nutmeg, and a dash of salt. On a well-floured surface with floured rolling pin, roll out one disk to a 12-inch circle. Transfer to the pie pan and press in the bottom and up the sides. Trim edge. Fill the pastry-lined pie pan with the apple mixture. Preheat the oven to 375 F;. Take the second disk out of the refrigerator and roll out on a floured surface with floured rolling pin. Transfer to the filled pie pan. Fold and crimp the edge as desired. With a sharp paring knife cut several slits in the top of the pie. Combine the egg yolk and milk or cream. 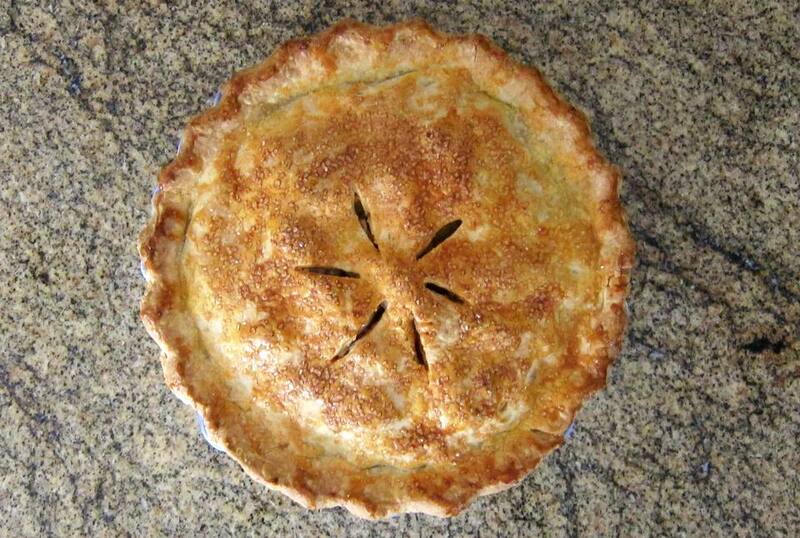 Brush the top of the pie lightly and sprinkle with a little granulated sugar or cinnamon sugar blend. Place the pie in the oven on a large sheet of foil. Bake for 50 to 60 minutes, until the apple filling is tender and the pastry is golden brown. *Put the foil ring on the pie before baking and take it off before the end of baking, or put it on after the crust is well browned.